Summer is the best time to relax and enjoy your Koi pond. You will enjoy your Koi pond the most during the summer. The temperature is perfect for your Koi and for you to sit by the pond. However, maintained should continue during all months of the year. Keep in mind these few things in order to insure you have a perfect Koi pond during the summer. Oxygen drops as the temperature rises. Fish must have oxygen to survive. You will see a decrease in oxygen in the water garden during the summer months. You must take precautions as the temperatures rise. You may notice your Koi are hanging out near the top of the water more often than in the past. They may even seem to be having problems breathing. These are two indications that the water does not have enough oxygen. The easiest way to keep your pond oxygenated is to install a waterfall or fountain. This will keep the water moving improving the amount of oxygen that is available for your Koi. If you are not able to add this type of feature then you will need to change the water often in order to keep oxygen levels high. Evaporation is another potential summer pond problem. As the temperatures increase and the sun moves closer to your area evaporation rates become higher. Check the water level of your garden each day and adjust as necessary. You may want to keep a rain bucket in an area that is protected so that you will have de-chlorinated water at a moment’s notice. If you need to add water, it must be chlorine free. The easiest way to de-chlorinate water is to fill up a large bucket and allow it to sit for several days. Parasites abound during the summer and cause your Koi harm. Parasites thrive in the heat and can bring illness to your Koi. You cannot often see these troublesome parasites, so check your Koi often to make sure they are in good health. You may notice behaviors such the fish rubbing up against the pond, scratching or shaking. Watch your Koi closely if you notice these things happening to your fish. If you see spots or changes on their skin, you must take immediate action. Sometimes you may see a fish actually knock off its fin. If any of these things occur, get your Koi to the local vet or Koi dealer immediately. Koi feeding considerations during the summer. Fish’s appetites grow tremendously during the summer. They will need a variety of nutrients in their summer diet. Stick to low protein food and feed them up to three times a day. If you notice, your fish are still hungry you can increase their food as well as add some snacks or treats into their diet. The best way to keep you Koi happy and the food from spoiling is to feed them small amounts of pellets. This will limit the amount of food left in the pond that could spoil. Fish only eat what they need to eat in order to survive, so pay close attention to the amount they are eating and you will limit the amount of uneaten food that could cause a dirty pond. Unfortunately, the more you feed the fish more oxygen will be depleted from the pond. 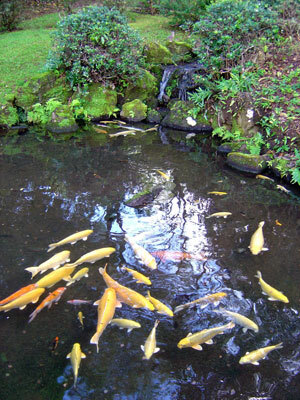 To alleviate some of the oxygen depletion feed the Koi during the cooler parts of the day. During the summer, you want to enjoy your Koi pond not stress over sick fish. Take time to keep the pond oxygenated correctly, add water as necessary, and provide a quality diet will help you keep your Koi ponds during the summer enjoyable for all. as well as other site updates and posts!! are the property of their respective owners. By using this website, you agree to our terms.